Very nice. I too love watching your progress. One suggestion. All of the ammo boxes come with markings describing contents - type, quantity, lot number etc. I don't see any. At least not so far. Mario, I just took t the time to go back a couple of pages to look at your photos very closely. You have absolutely perfected your pin wash technique. I cant find a single flaw on anything. Your work really does inspire me! You wouldn't believe how much time it took to get this tow recovery strap done. And to be honest, I'm not so happy about it. There are not many things to do to finish this build once and for all, but I'm finding it hard to keep interest flowing. Both images courtesy of my somewhat susbstantial SOF HWMMV walkaround. Thanks Rob, I appreciate your comments. Tow strap is actually orange... perhaps the color balance made it look more reddish on the photos. I have a plan to subdue the tone quite a bit during weathering stages. Thanks for the photos. 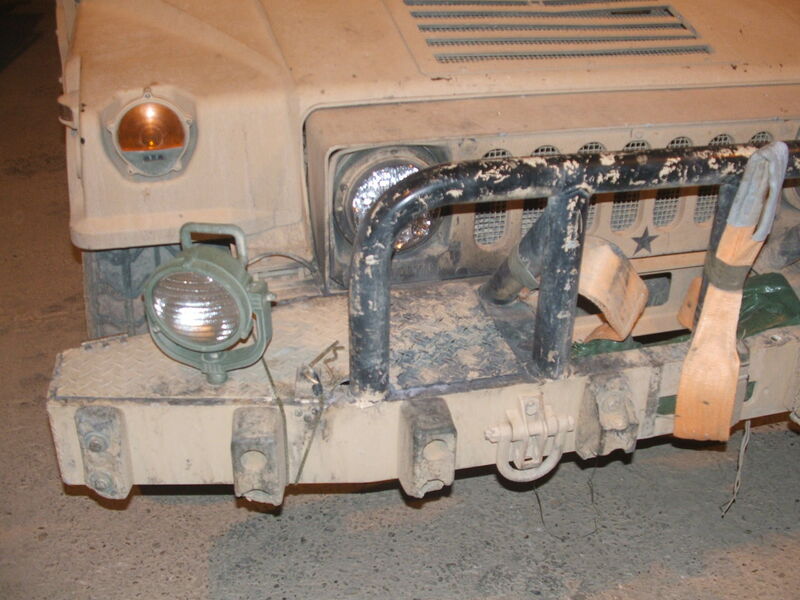 I like the idea of rigging two straps, perhaps I'll try that on my next Humvee build. I have your SOF Humvee walkaround with various GMVs (that's where I got the inspiration for this build), but haven't seen the photos you included in your post. The beauty of these walkarounds as opposed to a book is that I can easily (and without cost to you) send upgrades whenever they are added. Send me your email address and I'll send you the batch they belong to. Looking very good. I love the can of Coke! Please, keep posting more updates. Your build inspires me to begin work on my Tamiya M1025. OK, I'm calling this one finished. Terrific build. Very nice subtle weathering. The vehicle looks awesome!!!! A superb model. Wow the attention to detail and quality of craftsmanship is amazing. Keep up the great work. It came out beautifully! Definitely worth the wait. Can't wait to see how those figures come out. I loved your OIF M1025 build, but the detail on this truck has to take prize. Thank you for sharing the pics. Thanks guys, I'm happy you like the model. Mario, I feel like we've all been on a journey with you. A journey that took nearly four years. It had its ups and downs, but you made it. The end result is stunning. It gives heart to those of us who can't sprint through a build or binge build seven vehicles at one time. Your attention to detail is unmatched my friend. This is the best GMV I've seen so far. That is saying a lot since there has been done amazing work shown here by yourself, Piotr, and Kuba. Hope you start something new soon. Mario, to be honest I feel like I've cheated by going through this build start to finish in just an hour or two!! I had to register just to say how much I enjoyed it, and how stunning your work is. Thank you Liam, much appreciated. I've been going through a major upgrade of my workspace, so hopefully I'll start with the figures soon. Wow, that is truly an amazing build! Everything just pops! The Legend GMV conversion just pops with detail. Your paint job is so smooth and the amount of accessories and gear you added just increases the level of detail and eyecandy. Wonderfully marvelous job, Mario! Thumbs way up! Amazing work. Sample. I followed the construction with great pleasure. Incredible realism, study of every detail, perfect accuracy of Assembly and painting. It is without a doubt a masterpiece!